The 2014 World Cup is over and in the books. It was a great tournament for probably everyone across the globe but the host nation of Brazil. While there are many lessons to be learned from this event, the lead up to and events of this year’s World Cup provide some interesting insights for the compliance practitioner. 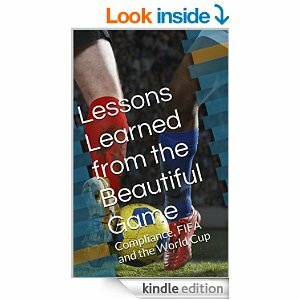 I have collected some of my writings on FIFA, the World Cup and the world of the ‘Beautiful Game’ in one volume, entitled, “Lessons Learned from the Beautiful Game: Compliance, FIFA and the World Cup”. It is now out and available from amazon.com in Kindle e-reader format. In this short volume I take a look at some for the following topics. FIFA and its selection process for the 2022 World Cup in Qatar. Performing due diligence and World Cup bids. What are some of the consequences for failure to set a proper tone-at-the-top. Leadership lessons from managers of some of the world’s top soccer clubs. Lessons learned from both compliance successes and failures. I am sure that you will find this e-Book gives you some ideas for your anti-corruption compliance program, no matter which FIFA country you might practice compliance in. Finally, you cannot beat the price, as it is only $3.99. You can order a copy by going to amazon.com or by simply clicking here.